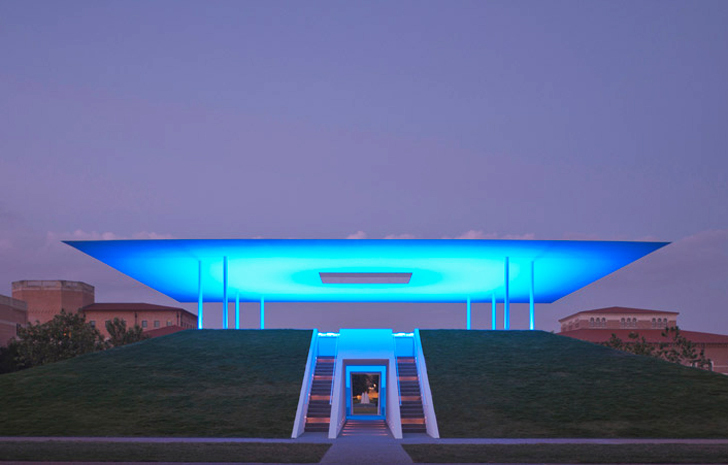 James Turrell’s Skyspace at Rice University. At least according to Daniel Grant. James Turrell, the artist whose medium is color itself, should instead turn to art law to gain more attention. The premise is exaggerated for effect, but only slightly when you consider the range of recent art law disputes questioning the very foundation of the visual arts. It is a great time to be interested in the intersection of art and law. In May, a Puerto Rican art collector and dealer named Roderic Steinkamp brought a lawsuit against Chicago art gallery owner Rhona Hoffman for having lost a work of art that he had consigned to her. Well, sort of. He had entrusted to her a certificate of authenticity and a diagram for a Sol Lewitt wall drawing, not the wall drawing itself, and she somehow lost this paperwork. Big deal, you think: you ask the Sol Lewitt estate for a duplicate certificate and diagram, maybe pay a fee for the trouble, just as you would if you lost the deed to your house or car. However, the Lewitt estate said no. “We don’t give duplicates,” said Susanna Singer, long-time business manager for Sol Lewitt and now an advisor to the estate. “We don’t want two certificates out there, raising the question of which is the real one.” . . . It’s the view of the estate that the certificate of authenticity and especially the diagram are the actual work of art; the paperwork is the art, rather than an installation of the wall drawing, and in this instance no installation appears to have taken place. The portion of the legal community that focuses on the arts (literary, performing, and visual) is still small, in part because there aren’t really that many disputes requiring counsel, and also because the people most likely to be wronged are lesser-known artists without the resources to pay for lawyers. It was big money that drove the lawsuits most recently, but these cases are also notable because they ask basic questions, from what is art to who decides where and how it will be sold and displayed. They’re questions that in an earlier age might have been more a part of the general discourse but are now left to the courts to decide. Perhaps, if he wants more attention, James Turrell should write a legal brief. The birth of art law as a field can only really be traced to 1979 and John Henry Merryman at Stanford, though there were of course legal disputes over art long before that. Yet he got lawyers and artists to think in an organized way about the intersection between law and the visual arts. Those questions seem to be getting more foundational as art becomes more conceptual, challenging our ideas of how value for art is created and how to resolve the inevitable disputes. Lawyers follow money sure, but so does art. Daniel Grant, The Art of Art Lawsuits, Hyperallergic (2014). I think about this issue frequently. I have heard an artist say that the meaning of art is in the making of the art and not the object that is made. Pretty things are very nice to see, but should they be venerated that way that they are? Doesn’t matter to me, but it seems that as a culture we are far too obsessed with artifacts. deer hunter 2014 hack android includes a big role with American Traditions. actions connected with deer hunter 2014 hack ios. can be included along with households tend to be produced collectively by simply this kind of. intended for deer hunter 2014 hack tool could possibly be thought to be a outcast. blog tramite Google , e ha scoperto che è davvero istruttiva. sacco di persone saranno beneficiato tua scrittura . Cheers! big role inside United states Lifestyle. A lot of people are frequently witnessed taking part in actions linked to Club Penguin Membership Generator 2014.
generally brought collectively through this kind of. Club Penguin Membership Hack might be deemed a great outcast. getting involved in things to do linked to telecharger gta gratuit. I’ve been surfing online greater than 3 hours lately, but I never found any attention-grabbing article like yours. but slow loading instances times will sometimes affect your placement in google and can damage your high-quality score if ads and marketing with Adwords. eternity warriors 3 hack includes a big part throughout American Lifestyle. mainly because individuals on most age range might be concerned and also families are produced collectively by that. eternity warriors 3 hack android may be considered the outcast. about what the FCA have permitted them to.